The carved stone figure of the head and shoulders of a man, 'The Fisherman of Deane', built into the outside wall near the porch, has weathered many a storm. He was originally fixed over the Hulton door. With his fingers in its mouth, he carries a fish slung over his shoulders. 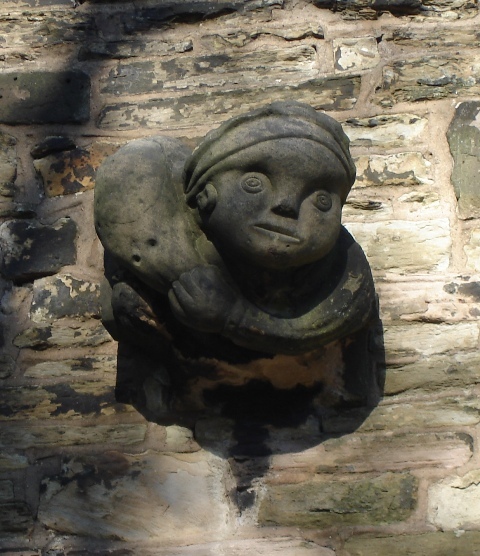 It is thought that he represents the "fishers of men" of the Whalley Abbey motto, and it may reasonably be assumed that a monk of the abbey was the sculptor. Actually, the fishes of the coat-of-arms were whales and were chosen as a play on the place-name, Whalley. Such arms are known as "canting arms."